← A Seriously Inappropriate Ad Shown Here! 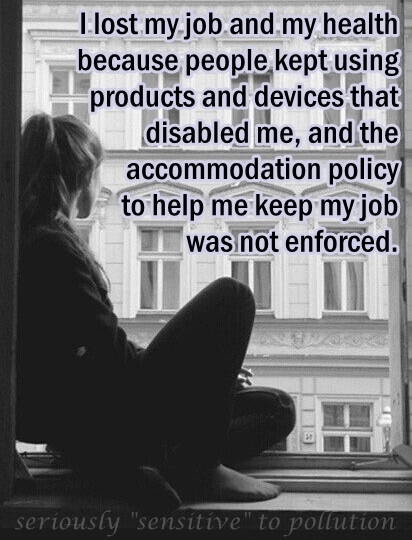 When we develop MCS/ES, one of the first concerns we have is how to keep our job when other people keep using products and materials that disable us. Some people are able to negotiate a legally required accommodation policy, but sadly, too many people find these policies are rarely or effectively enforced as they should be. 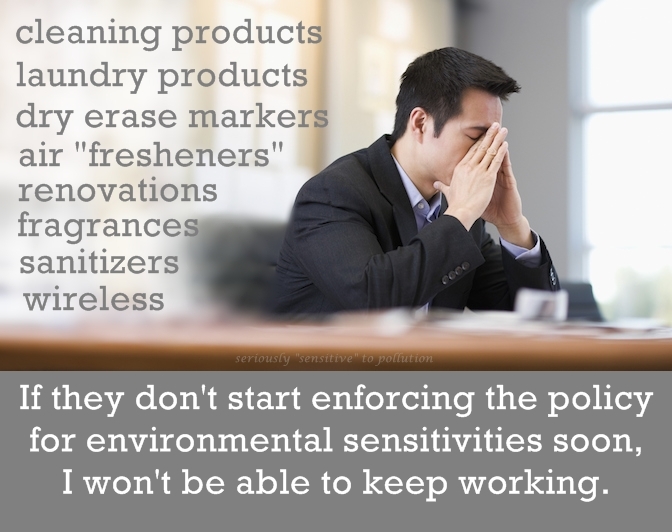 “Significantly, 15.1 % of the general population reported that exposure to fragranced products in their work environment has caused them to become sick, lose workdays, or lose a job. Also, 20.2 % of the population reported that if they enter a business, and smell air fresheners or some fragranced product, they want to leave as quickly as possible. No-one should lose their health, abilities, and job because of other people’s product habits, especially products that are optional and not medically required. Finding and implementing the use of safe and healthy products and practices is straightforward and simple, but only when the attitudinal barriers are addressed and removed. Please remember too, that accommodating people with environmental, chemical, and electro “sensitivities” benefits everyone, as these accommodations make all environments healthier for everyone who uses them. PS… I have no control over the ads that get shown here. This entry was posted in Accessibility, Air Quality, Disability, Environmental Sensitivities, Human Rights and tagged EHS, employment, enforcement, fragrance-free policy, indoor air quality, jobs, MCS, MCS/ES, policies. Bookmark the permalink. It’s crucial that any policy that is created to accommodate people with MCS/ES be enforced, and from the top down. The person needing the accommodation should not be subjected to repeat offenders and expected to put up with it or to keep reminding them when they keep “forgetting”. No-one in their right mind would keep feeding peanuts to someone who suffers adverse effects that can become life threatening. Likewise, no-one should keep subjecting a person with MCS/ES to exposures that cause disabling effects which can become life threatening, and definitely threaten someone’s ability to remain employed. “How can managers intervene early enough so the bad behavior doesn’t escalate? Thanks for the great post. I don’t have the energy today to go through the ridiculousness that I went through trying to get people to accommodate a no “fragrance” policy so I could keep my job. As you know, I’m disabled now — so obviously it didn’t work. It will be interesting to see what happens when there are more people disabled with MCS/EI than are working. I hope so too. But since nothing significant is being done to resolve the problem — can the tipping point be far off? As someone who lost the right to work because my employer fought NOT to accommodate my chemical sensitivity, my life was profoundly affected financially and socially. Adopting the motto, “Every problem is an opportunity,” I have forged on so that resentment and negativity have no time to creep into my thoughts. In fact blogging has taken a backseat to the activism for environment and disability that occupy my waking moments. I am ever grateful to Linda for the work she does on this BLOG. Thanks for all your activities too Elaine!